ConocoPhillips has been responsibly delivering Liquefied Natural Gas (LNG) to the world since 1969. LNG is produced from natural gas and is an extremely clean energy source found in reservoirs deep beneath the earth’s surface. Natural gas consists mainly of methane and is odourless, colourless, non-corrosive and non-toxic. Natural gas is used extensively around the world in homes and industries for cooking, heating, electricity generation, as a vehicle fuel, and for other industrial uses. Liquefied Natural Gas is produced from natural gas, which has been cooled to liquid form at minus 161 degrees Celcius, making it easily and safely transportable to markets around the world. LNG is transported in large double-hulled ships – essentially insulated tanks within tanks. 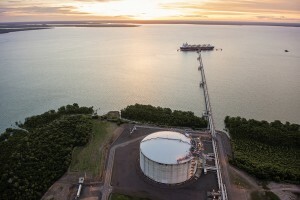 LNG facilities and loading jetties have a proven track record of being safe and secure, and include exclusion zones to ensure the highest safety standards. LNG is different to Liquefied Petroleum Gas (LPG), which occurs naturally in some crude oils and is a by-product of petroleum production. LPG is delivered into pressurised storage tanks or supplied in cylinders. It is often used for portable applications such as barbecues or in caravans and boats, or for homes, farms and businesses for cooking and heating where mains gas in not available. LPG may also be used as a transportation fuel and is widely used for powering forklift trucks, as well as a niche application to fuel cars, trucks and buses adapted to its use. Natural gas from some source rocks is described as conventional and from others as unconventional. Conventional gas comes from porous and permeable reservoirs often in sandstone or limestone, which have interconnected spaces in the rock and which allow the gas to be extracted easily into a well bore, through which the gas flows to the surface. Unconventional gas comes from reservoirs with less permeable rocks. It is difficult to extract the gas in this situation because it cannot naturally flow to the well bore. It may therefore be necessary to use technology such as hydraulic fracturing to create pathways through the rock, and through which the gas can then travel to the well bore. Examples of unconventional sources are coal seams and shale, which give their names to the gas that comes from them.